3 How Do Tower Fans Work? The best tower fans that blow cold air can make the warm season more bearable. These models can circulate the air in a room making you feel a pleasant breeze instead of the tormenting heat. And using a tower fan will not only increase your comfort, but it will also protect your budget against unnecessary spending. In the first part of the following article, we present the top tower fan reviews of 2019. These models will produce a cooling breeze that will keep you cool during the summer, and they will do it silently. In the second part, we take a look at some of the features that make a tower fan good, and examine how each of them can influence your experience. Before we end the article, we compare how these models perform in relation to pedestal fans and let you decide which are better. DIMENSIONS : 9 x 12 x 30"
DIMENSIONS : 4.4 x 7.5 x 39.6"
DIMENSIONS : 38 x 7.2 x 9.5"
DIMENSIONS : 8.4 x 10.9 x 33.1"
DIMENSIONS : 12 x 8.7 x 35"
Let’s start by mentioning the powerful motor that this Lasko 4924 blower fan has. It surely will help you feel cooler throughout the hot days. It has top-mounted controls with three-speed settings to give you all the comfort you need – low, medium, or high speed. There is just one push of a button between you and the optional widespread oscillation that the fan offers. The slim design is perfect for saving space and the easy movement of the device is guaranteed because of the built-in carrying handle. As we said, the unit’s operation is really easy for it not only has top-mounted controls but also directional louvres. 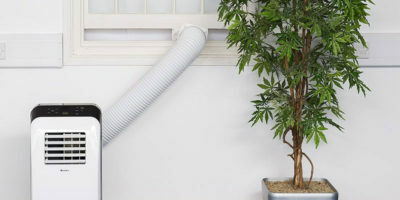 This way you get an accurate air delivery and an effective air circulation all year long. A great asset is the Blue Plug that all Lasko fans have. It is an added safety device. If the fuse inside the plug decides that there is even a small chance of hazardous electrical fault it cuts off the electricity. 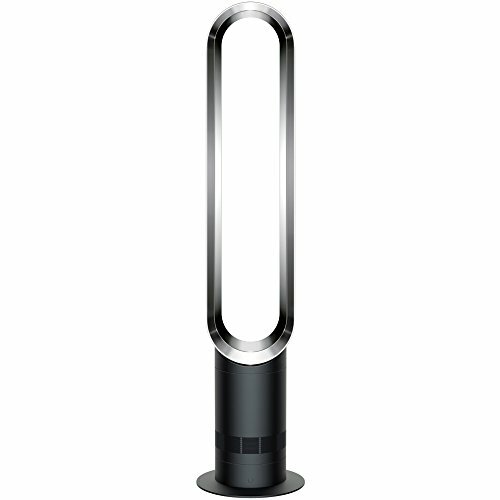 The Dyson AM07 tower fan is a great model for those who are looking for a bladeless cooling solution. Thanks to its bladeless design, this tower fan is a safe option for people who are concerned about their children and pets when they’re not home. One of the things we liked about this model is that it comes with no less than 10 airflow settings, making it suitable for every kind of room, no matter how small or large it is. Another good thing about this model is that it’s very silent. You can set up the cooler in a study or in a bedroom without it bothering you while it’s working. As far as the fan’s airflow is concerned, this model uses an air multiplier technology that creates a powerful constant stream of air. 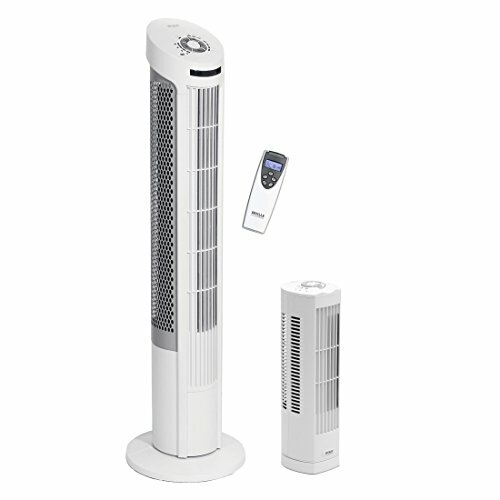 The bladeless design also means that this tower fan has lower maintenance than other models. No matter how often you use it, the fan won’t build up dust, and it’s extremely easy to clean. Attractive Design – The tower fan is not only efficient, but it’s also aesthetically pleasing. This will make it fit in most decors. 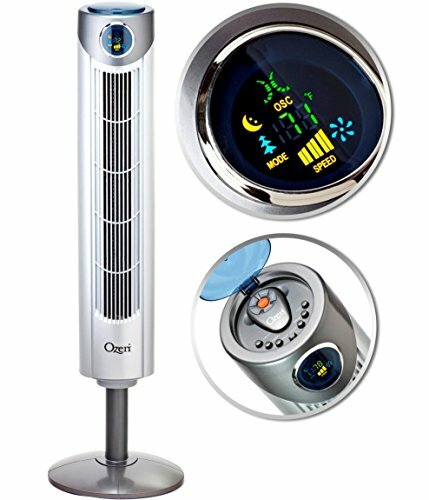 The Ozeri Ultra is a stylish tower fan that can cool down large rooms and fits in most decors. This model has a compact design and it comes with an easy-to-use control panel that allows you to control all of its features. You can track all the used settings on the large LCD display. One of the things we liked about this model is that it comes with helpful preprogrammed features. Instead of wasting time trying to figure out which of the fan’s settings would be most suitable for one scenario or another, you can simply choose one of these features and let it run. The tower fan also comes with 3 whisper-quiet settings that will allow you to use it comfortably at night or when you’re engaged in other demanding activities. You will need to assemble the tower fan on arrival, but the assembling process is easy and you won’t need any tools for it. This little gadget only seems small. It has turbo wind generator blades that are extremely powerful and move air faster than typical blades. The fan offers three speeds with which you can be sure that the oscillation in your room will be perfect. The Honeywell fan also gives you the option to turn on a breeze mode. This mode will give you the impression that there is a gentle outdoor wind in your own living room while you are reading your book and drinking your coffee on the couch. And if you want to turn off the fan without having to get up from the couch, there is an automatic shut down in 2-,4-, or 8-hour intervals or you could just use the convenient remote control that you will also receive. Although the motor is strong, the performance is really quiet and the tilted head is perfect for directional cooling. 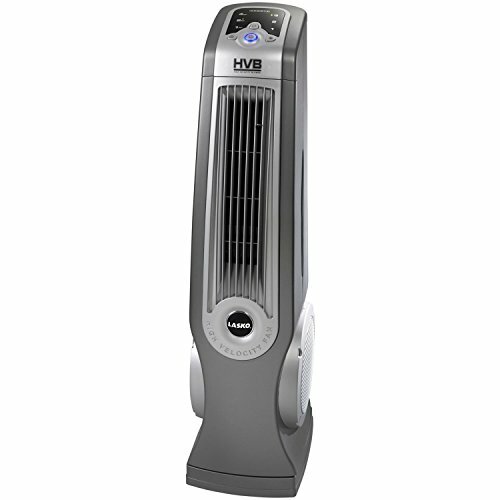 The Lasko #4930 is a high-velocity tower fan that is powerful enough to reduce the temperature in a medium-sized room. This model comes with multiple helpful features, and it’s a great choice for those who want to cool down a room quickly. We were impressed by this fan’s cooling capacity. Thanks to its oscillating fan blades, the Lasko tower distributes the cold air throughout the room, spreading it faster than other models. Since this unit has a high velocity, it will cool down a room even if it’s really hot to start with. Another good thing about this model is that it’s very easy to use. The fan comes with a user-friendly control panel and remote control, so you can use either of them to change its settings. On/Off Timer – Using the tower fan on/off timer can lower your electricity bills. Not Quiet – Even though this model is very efficient, it’s not very quiet. Some people might find it difficult to sleep in the same room with the fan when it’s working. DIMENSIONS : 10.8 x 8.2 x 32.8"
DIMENSIONS : 42 x 12 x 6.5"
DIMENSIONS : 7.25 x 7.4 x 23"
DIMENSIONS : 32.8 x 10.8 x 8.2"
The Honeywell HY-280 QuietSet is a great model for those who are looking for a silent cooling solution. Despite the fact that this model is capable of moving a lot of air around the room, it does it silently, without interfering with your regular activities. Thanks to its silent operation, this model would work nicely as a bedroom fan. We really liked the fan’s silent operation. This model comes with no less than 8 fan speeds, but all of them manage to move the air silently. 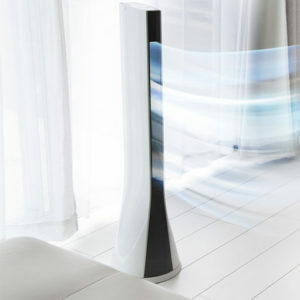 In fact, this might be one of the most silent bladed air fans currently available on the market. Another good thing about this model is that it covers a large area. Thanks to its oscillating louvers, the tower fan spreads the cool air in a wide area, facilitating its access to the most remote corners of the room. Very Quiet – The Honeywell HY-280 is very quiet, and using it will most likely not bother you as you work or as you sleep. Good Capacity – This model is capable of cooling down a large room with ease. Bright LED Panel – Even though the tower fan is quiet enough not to disturb you during the night, the bright LED panel might actually ruin your rest. The LEDs are so bright, it might be better if you covered them up at night. 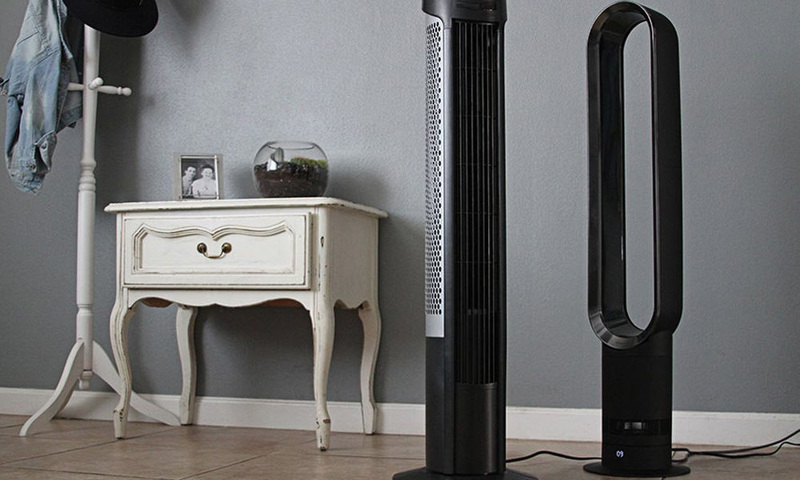 The Arctic-Pro tower fan has a simple yet effective construction. This model comes with a space-saving design that will not take up too much space and will look great in most decors. Thanks to its front grill, this model is safe to use in households that have children or pets. One of the things that impressed us about this tower fan is its range and coverage. This unit provides 80 degrees of oscillation when blowing the air, spreading it quickly throughout the room. This will lower the room’s temperature quickly, making it more comfortable. Another good thing about this model is that it comes with a night mode. Using the night mode will turn off the fan’s control panel screen, and by selecting its lowest fan power you will be able to sleep without the fan bothering you. 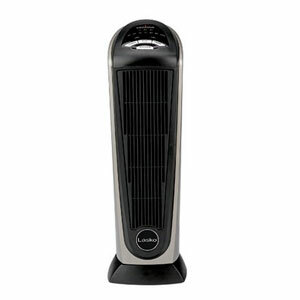 Remote Control – This tower fan comes with a remote control, so it’s very easy to use. The Lasko Woodgrain is a stylish model that will not only blend in with your room’s décor, but it might actually improve it. This model comes with wood-grain accents that will match a wide variety of interior and furniture styles. Besides being stylish, this model is also efficient. The fan is easy to move from one room to another and it uses slip-resistant feet to maintain its stability even on slippery surfaces. One of the advantages of using this model is that it comes with a helpful electronic timer. Using the timer will help you lower the room’s temperature without increasing your power bills unnecessarily. This model is fairly easy to use, and it comes with a user-friendly control panel and remote control. There are three fan speeds you can choose from, and the fan’s motor is fairly quiet. Quiet – All of this fan’s speeds are quiet, but the lowest one is barely perceivable. This makes the tower fan suitable for bedrooms. Short Power Cord – This model comes with a short power cord, so your placing options will be limited. 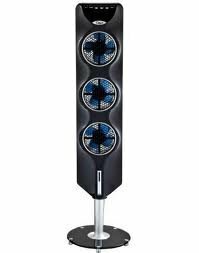 The Ozeri tower fan has an interesting design and a silent operation that makes it perfect for people who are looking for a cooling solution for their offices or their living rooms. This model uses 3 independent fans to circulate the air, and each fan can be controlled independently. One of the things we liked about this model is that it’s very efficient. The fan offers up to 9 levels of cooling and you can even customize the airflow. Moreover, there are 3 preprogrammed airflow patterns you can choose from, making the fan easy to use when you’re in a hurry. Another good thing about this model is that it comes with a wide oscillation pattern that makes the fan very efficient. The oscillation pushes the cool air in a 90-degree radius, so it will distribute it evenly throughout the room. Looks Great – This model has a very nice design that will look great in most rooms. Good Air Control – This tower fan offers 9 levels of cooling you can choose from, making it very versatile. Not Very Powerful – This fan might look good, but it’s not very powerful. The fan is powerful enough to cool down a medium-sized room, but not a large one. You might be surprised to find the Lasko ceramic heater on this list, but you shouldn’t be. This model can be used as a heater, but you can also use it with good results as a fan as well. Turning on this unit without using the heat function will turn it into a regular fan, making it suitable for the warm season. When the weather gets cold, you can turn on the unit’s heat, and use it to warm up the room. Basically, this unit brings together the best of both worlds. 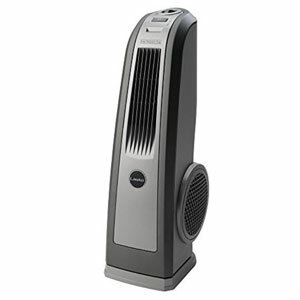 One of the things we liked about this model is that it has a great fan capacity. The unit’s fan uses oscillating louvers to distribute the air around the room, making the fan more efficient than other models. You can choose between two fan speeds, and both of them are fairly quiet. As you can imagine, the lowest one is more silent, so we recommend using that one if you’re a light sleeper. Doubles As A Heater – This model can double as a heater in the cold season. Fairly Quiet – This model is not very loud, so most people will be able to sleep in the same room with it when it’s working. The Honeywell HYF290B Quietset is a great budget choice for those who are looking for a cooling solution that won’t make a dent in their savings. This model comes at a great price, but despite its low price, it offers a great efficiency. One of the things we liked about this model is that it’s specially designed to work as a bedroom fan. You can use up to 8 fan speeds, each of them pretty quiet. In fact, the Honeywell is silent even when it uses a higher speed, so chances are you won’t be disturbed by it when you want to sleep. And as an improvement from the previous models, this unit uses a light dimming feature. You can choose from 5 lighting settings. Each of them will reduce the lighting by 25% until it’s completely turned off. Remote Control – This unit comes with a remote control, making it very easy to use. Timer Could Be Better – You can only set the timer to 1, 2, 4, or 8 hours. It would be better if you could set it to something in between. The Seville Classics UltraSlimline tower fan is a great model for those who want to cool down a small and a medium room. This combo pack comes with two fans, a large one, and a small one. The large unit can cool off a small to medium room while the small one can be used with great results as a personal cooler. One of the advantages of choosing this combo pack is that both models have very good designs. Both the large and the small fans come with a protected grill that will keep the blades out of touching range. This makes the fans safe and suitable for households with small children and pets. The fans are also quiet and stable, and the large one comes with a remote that makes it easier to control. Remote For Large Fan – Even though this combo comes with a fully-functioning remote control, the remote will only work with the large fan, not with the small one. The MineTom tower fan is a small model that can be used with good results as a personal cooling solution. This model has a slim design that doesn’t take up too much space and it uses 3 fan speeds to circulate the air in the room. We liked that this model has a quiet operation. The fan’s lowest speed is barely noticeable, but not even the highest speed is very loud. As far as the fan’s cooling capacity is concerned, this model can be used with good results as a personal desk cooler, but it might work as a whole room fan in a small-sized room as well. The fan uses an oscillating feature that will push the air in different directions, making it more efficient. Not Very Powerful – This model is not very powerful, so it won’t be very efficient as a whole room fan. Even though they might look alike, tower fans offer widely different performances. This is why most people have a hard time finding the best tower fan for their needs. In the following section, we explain which features are helpful in a tower fan, and how each of them will influence your experience. Quiet – These models are not as quiet as the previous ones, but they can’t be considered loud either. While they don’t use whisper-quiet technologies, they don’t produce loud noises. And while these models are suitable for most situations, people who are light sleepers might find it difficult to sleep with a working unit in the same room. However, these units are not loud enough to interfere with your usual activities. Not Quiet – Well, some models are not quiet. While most of them are not as loud as the models your parents used to use in the olden days, they’re still loud enough to wake you or to prevent you from falling asleep at night. These models are usually powerful, but just because they’re loud, it doesn’t mean that they’re more powerful than the silent models. However, most of these units can be used as whole-house fans which could mean you won’t have to stand close to them when they work. But when you stand next to them, the sound they produce might interfere with your other activities, which can be bothersome. Ease Of Use – You could say that most tower fans are easy to use, but the reality is that some of them are easier to use than others. Manufacturers always look for ways to improve their models, and improving their controls is one of their priorities. There are certain features that facilitate the fan’s ease of use. LCD Display – Some tower fans come with small or large LCD displays that will highlight all the features the fan is using. This can be a very helpful feature, as it will give you a clear idea of which of the features are in use and allow you to keep track of all the changes you make with ease. Remote Control – Having a remote control can be extremely helpful. In fact, most manufacturers realized that, and they include a remote control in their package. A remote control will allow you to turn the tower fan on or off while you’re away from it, which makes it easier to use. However, most fans’ remote controls still use the infrared data transmitting technology, which means you will need to have a clear line of sight to the fan if you want the remote to work. Digital Control Panel – Using a digital control panel is very easy. All the settings are clearly outlined, and you can clearly tell which settings are in use and which are not. Preprogrammed Features – Even though they might not seem very helpful at first glance, the preprogrammed features can be really useful at times. Instead of pushing a lot of buttons to select precisely the combination of features you’re looking for, you can either use a preprogrammed feature if you find one similar to your tastes, or you can start changing the fan’s settings using the preprogrammed feature as a starting point. Fan Speeds And Modes – Some tower fans use a simple approach to their air-pushing capacity. They offer several fan speeds you can choose from, with each speed being faster than the next. Some models use only two or three speeds, while others can use as many as 9 or more. As a rule of thumb, it’s better to choose a model that comes with more fan speeds because these models tend to be more versatile. You can move these models from one room to another and set their fan speed according to the room’s size without risking cooling it more or less than you should.But some fans don’t use the simplistic approach. Instead of presenting the fan’s power in speed increments, they use modes. One of the frequently encountered modes is the night mode. When you engage this mode, the fan will run on its lowest setting so it won’t bother you when you sleep. Moreover, some models will also reduce their luminosity when you select the night mode, making them even more suitable for the bedroom. Even though using the modes can seem complicated at first, you get used to it quickly and you will be able to use them as you would the speed settings in no time whatsoever. 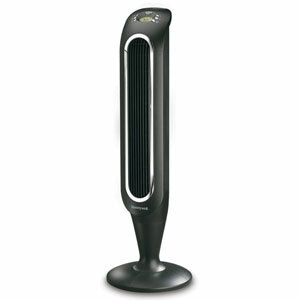 Timer – Using a tower fan that comes with a timer can be a tremendous advantage. There are two kinds of timers fans use, each with its own advantages. Turn Off Timer – Using an Off timer can be helpful, especially if you want to use the fan at night. Instead of letting the fan work overnight, you can simply program it to shut down after a specific amount of time. Not only will this ensure you will already be asleep by the time the cooler turns off, but it will also lower the fan’s operation costs because it will limit the time it runs. Turn On Timer – Using a fan that comes with an On timer is even better because it can further lower its running costs. For example, if you’re at work but want to find a cool living room when you get home, you can simply program the fan to start working when you leave work or when you’re close to home. This is an economical alternative to letting it run all day long until you get home, and it’s also an eco-friendly way to use the fan. Coverage – As you could see from our short tower fan reviews, there are no two identical models. One of the most obvious differences you can spot between models is their size. But one of the most important features of a tower fan is its coverage, and unfortunately, you can’t determine this feature just by looking at it. Here are some factors that influence a unit’s coverage. Air Blowing Capacity – As you can imagine, a tower fan that can push the air with more power will cover a larger distance. As a rule of thumb, larger units will most often than not circulate more air than smaller ones, so when it comes to tower fans, the bigger the better. 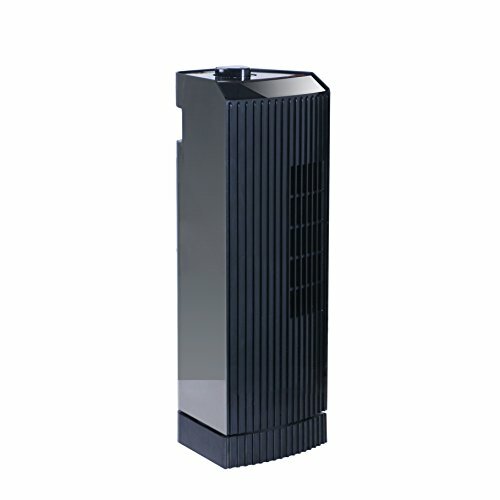 Oscillation Feature – Some tower fan models use louvers to push the air in different directions. This feature is frequently discarded as useless by buyers, but it can be really efficient. Instead of pushing the air in a single direction, a tower fan that uses an oscillation feature will spread it in a wide radius instead. Some models have oscillation patterns that push the air in a 45-degree radius, while others will push the air in a 90-degree radius or even more. Using the oscillation feature will allow the fan to circulate the air around the room better, increasing its efficiency. Angling – Some models don’t use an oscillation feature, but they still give you the possibility to angle the direction of the louvers. This is also a great option, as it will give you the possibility to angle the louvers so the cool air will hit you directly or will avoid you when you want it to. Even though it’s not as efficient as the oscillation feature, creating a direct or indirect breeze can improve your comfort. Anti-Slip Feet – To improve the tower fan’s stability, some manufacturers use anti-sleep feet instead of normal ones. These feet will not make much of a difference if you place the fan on a carpet, but they will be very helpful if you place it on other surfaces, including slightly shiny ones. Some of these feet are so efficient they will create a small vacuum that will keep the tower fan in place even when you bump into it accidentally. Wide Base – Instead of using feet, some manufacturers use circular bases to improve the stability of their products. By increasing the base’s radius, they also increase the fan’s stability. Aspect – You might be surprised to see the tower fan’s aspect as one of the features you should look for in a model. Well, you shouldn’t be. Would it matter if a fan was efficient if it was so ugly you would be ashamed to display it in your home or office? Well, probably not.Fortunately, manufacturers know this and they constantly try to improve their products’ designs. Now, we’re not saying that the fan’s aspect should be one of the determining criteria you use to find the best model for your needs, we’re only saying that you should consider it as a criterion as well. Warranty – Buying a product that comes with a warranty is always an advantage. Reputable tower fan manufacturers will offer warranties. Some manufacturers will offer 2-year warranties for their products, while others can even offer 5-year ones. However, we found out that most manufacturers offer a 1-year warranty against material or manufacturer defects. Price – Last but not least, you should also think about how much you’re willing to spend on a tower fan. Some models are so cheap they won’t make a dent in your budget, while others come at prices that might negatively surprise you. As always, you shouldn’t think that one model or another is better than the rest just because it’s more expensive than its competitors. However, it might happen that the expensive model comes with helpful features or specs that the other models don’t use. Tower fans work in a simple and straightforward manner. These units move the air around the room, creating a wind-like effect. When you use a tower fan, you feel cooler thanks to the wind-chill effect they produce which is similar to a breeze you would experience in nature. Fans cool you instead of cooling the environment. However, the air’s circulation around the room can lead to a slight decrease in the temperature, but nothing you would notice without the help of a precise thermometer. Since they keep the temperature mostly intact, fans are better suited for situations when people who enjoy different temperatures use the same room. Bladeless Fans – Despite their name, bladeless fans actually use blades to circulate the air, only you don’t see them. Instead of using the blades on their top, these fans employ them in their bases. The fans rotate and the air enters the tower fan through an air valve and then circulates to the top of the tube where it exits through a circular opening. The main advantage of using this design is that it’s more silent than the ones that use external fans. Other notable advantages are that the air is moved more smoothly, increasing the fan’s cooling quality and that these models are safe for children and pets. Centrifugal Fans – Unlike axial fans that face the direction of the airflow, centrifugal fans are actually placed perpendicular to the airflow. This creates a higher pressure which will rotate the fans faster. This will increase the fan’s cooling capacity. Check out our reviews on window fans for a fixed solution. You might be wondering why you should use a tower fan instead of a pedestal one. Well, there are a lot of reasons for this, but here are some of the most important ones. Design – Tower fans have better designs than pedestal ones. For one, tower fans tend to be more stable than their counterparts, but that’s not a decisive factor. As long as you’re careful with them, both these designs can be used with good results. But one definitive advantage is that tower fans are safer to use. 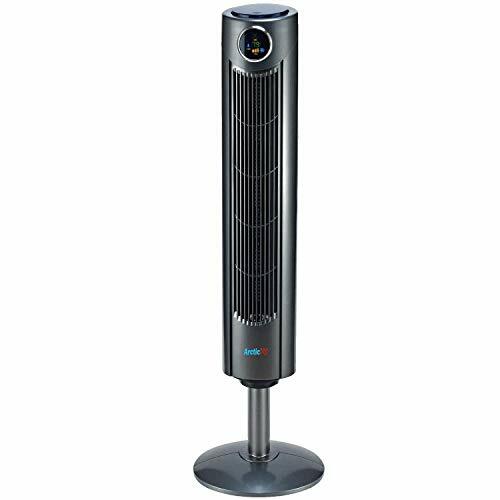 Unlike pedestal fans, these units do not have any moving parts that can be touched. This means they’re safer to use in households that have children or pets. Noise – The moving parts of the tower fans are closed in the plastic body. This means that some of the noise produced by the moving parts make will be blocked by the fan’s casing. Maintenance – Tower fans have simple and straightforward maintenance. You don’t have to disassemble the fan to clean them, you only have to vacuum them once in a while to get rid of the dust built-ups. Moreover, bladeless models only need a dusting once in a while. To clean a pedestal fan you need to take off the grille and dust every blade in particular. This process is not difficult, but it’s more time-consuming. Are you looking for a more effective solution to cooling indoor living spaces? 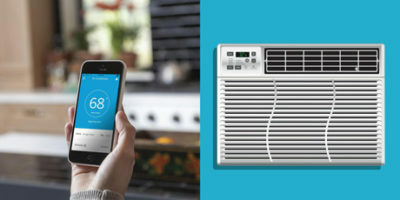 From the small ACs to the low-noise window air conditioners and the top rated portable air conditioners, let’s take a closer look at the most popular alternatives to AC units! You may also like electric portable space heaters available online! Choosing the best tower fan that blows cold air should be easier once you go through the comprehensive buying guide we prepared. As you could see, there are several features you should take into account, but some of the most important ones are the unit’s efficiency, the presence of the oscillating feature, and of course, its price. We hope our tower fan reviews gave you a clear idea of how each model will benefit you, and which of these models will be the best cooling solution for the coming warm season.